Our Honda radio codes are available 24 hours a day 7 days a week. Most Honda radio codes are displayed instantly after purchase. We guarantee our radio decodes work, and its totally free! When the radio is turned on ‘Code’ should display on the radios display. There will be 10 characters in the radio serial number. The letter ‘U’ followed by 4 numbers then the letter ‘L’, also followed by 4 numbers. Honda Radio LabelTo find your Honda serial number, you will need to remove the radio using radio release keys. Once the radio has been removed you will need to locate the radios label, which is on the top or side of the radios casing. Audio Unit Serial Number Retrieval. 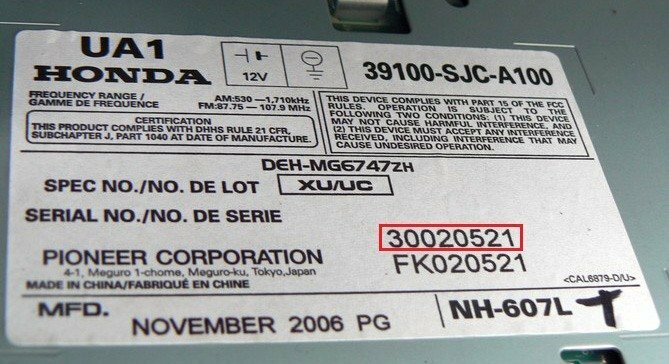 Honda Radio LabelFor certain models, the dealer may have placed a label with the device serial number on a sticker inside the glove box. If ‘Err’ shows on your radios display after attempting to enter your radio decode, simply turn off your radio and start the process again.